I add coffee to my batter mix when baking anything with chocolate. It enhances the chocolate flavor but it doesn’t taste anything like coffee. I simply use instant coffee mix and dissolve it in boiling water so that the cupcake batter isn’t grainy. To make your cupcakes light and fluffy, it’s important to not overbeat the cupcake batter. It helps prevent overmixing by blending the ingredients until they are just combined. Adding the flour and the sour cream in the end will help ensure that your mix will create light and fluffy cupcakes and not dense cupcakes that fall flat. I use a chocolate bar to make my frosting. I chop up the chocolate bar and melt it using a double boiler. I then add it to the other ingredients. It’s important to beat the frosting really well so that it comes out smooth and creamy. If for some reason the frosting is not smooth, you can make it smooth by heating it in the microwave for a few seconds at a time. It will require refrigeration at this point but it will fix any issues with being creamy. After it has cooled back down, simply beat it once more before frosting your cupcakes. 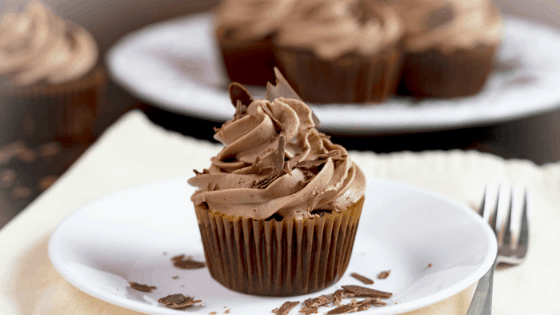 If you wish, you can add a chocolate shaving garnish to your cupcakes. I use the back of a chilled cookie sheet to make the shavings. I spread melted chocolate evenly in a thin layer using an offset spatula and place it in the refrigerator to firm. Before it becomes too cold, I take it out of the refrigerator and use the offset spatula to push the chocolate into curls. Homemade chocolate cupcakes with a rich chocolate frosting. Line muffin tins with 24 liners. Add in 1 egg at a time. Add in the salt, vanilla, baking soda, and baking powder. Stir. Add in the cocoa powder. Combine the boiling water and the instant coffee in a cup and stir until dissolved. Slowly add in flour and be careful not to overbeat. Gently stir in the sour cream until mixed. Fill liners halfway and bake for about 15 minutes. Check center of cupcakes with a toothpick. Melt the 6 oz. of chocolate using a double boiler. Stir in the vanilla extract, followed by the confectioner's sugar. Add in the melted chocolate and beat.